In New Hampshire, real property can be transferred from one party to another by executing a warranty deed. 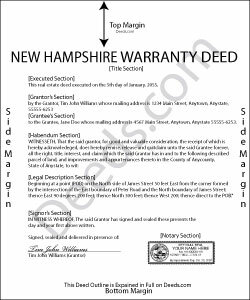 Warranty deeds are statutory in New Hampshire under RSA 477:27 and transfer fee simple title with covenants, or guarantees from the seller (grantor). The grantor promises that, at the time of conveyance, he or she "was lawfully seized in fee simple of the granted premises" and has good right to sell and convey said premises; that the property is free from all encumbrances, except for restrictions stated within the deed; and that he or she will warrant and defend the property against any lawful claims and demands made by all persons (RSA 477:27). Unlike a quitclaim deed under RSA 477:28, a warranty deed guarantees the property against any and all claims. Quitclaim deeds only guarantee the title against claims that arose during the time the grantor held title to the property. A lawful warranty deed includes the grantor's full name, mailing address, and marital status, and the grantee's full name, mailing address, marital status, and vesting. Vesting describes how the grantee holds title to the property. Generally, real property is owned in either sole ownership or in co-ownership. As with any conveyance of realty, a warranty deed requires a complete legal description of the parcel. Recite the prior deed reference to maintain a clear chain of title, and detail any restrictions associated with the property. Include a spousal waiver of interest under RSA 148:5-a, if applicable. Finally, the deed must meet all state and county standards of form and content for recorded documents. A Real Estate Transfer Tax Declaration of Consideration must be filed for both the grantor and grantee (RSA 78-B:1). Contact the local assessor's office to determine the appropriate version of the form. This article is provided for informational purposes only and is not a substitute for legal advice. Contact an attorney with questions about using warranty deeds or for any other issues related to transfers of real property in New Hampshire. Reply from Staff: Thank you Matthew!